Usually I hate the tutorials that claim to be easy or no-sew and then require some obscure bonding agent to actually accomplish, but I think this is different. All you need is a hot glue gun(mine was just a couple bucks at Walmart) and it seriously does make the project simpler. 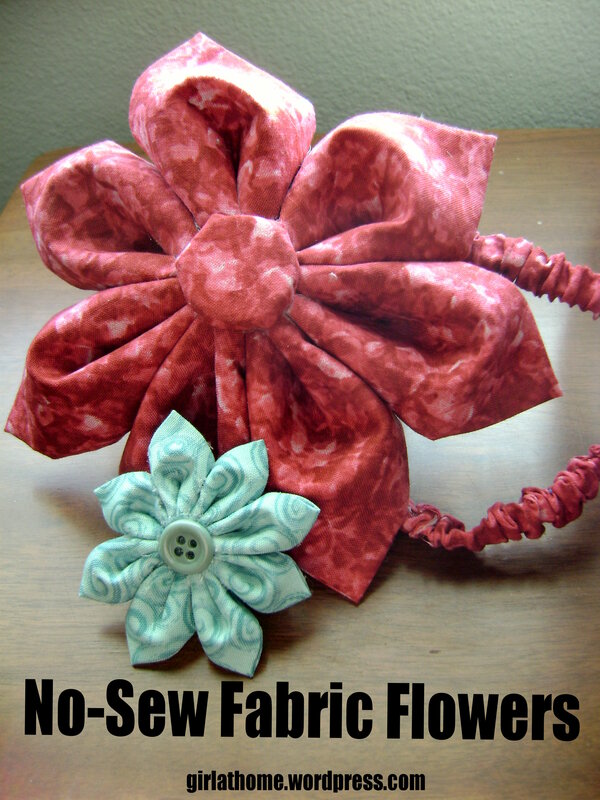 I’ve made the same flowers by sewing and it works, but it’s a lot faster with the glue gun. 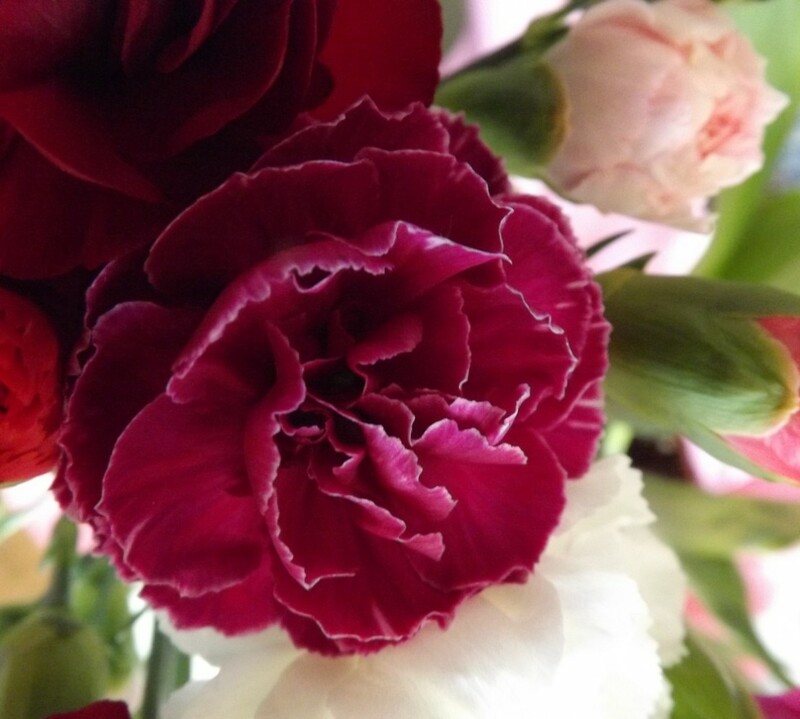 These flowers are really easy and give you a lot of impact for whatever you want them for. I attached the pink flower above to a baby size headband for one of those fun, giant flower/little baby headbands. I’ll sew the blue flower to a hair clip for a less over-the-top look. Ben suggested that you could paint a tree or flower stems on a wall and then attach the big flowers for some 3D wall art. Whatever you decide to do with them, they’re definitely fun to play with. Here’s how I made them. First you’ll need seven fabric squares. Then diagonally so that the raw edges meet. so you have a little airplane. If you fluff it open and pull the point down you can see the petal taking shape. and run a thin glue line to keep your wings from coming up. Not the length of the petal, just the line where my finger is pointing. A little glue along the same line of the top keeps the petal shut. until all your petals are formed. See how they don’t quite want to be a flower shape? Trim the back point(raw edges) off of three of your seven petals. Then start alternating trimmed and not-trimmed and gluing then together along the back(newly trimmed) edges. and fluff them open to make sure you have enough petals. My blue flower above needed one more petal to be full enough. Glue the last spot. At this point I added a thin glue line between each pair of petals to make the petals stay open and close together. Again, not to the point, just where they already are close. Go to the bottom side. See how it’s open? It will feel a bit wiggly and unstable. Put some glue in the open spots and squish it together a bit. Back to the top, we have a hole. I’m going to use a button to cover it up. I decided to cover a plain button with some matching fabric. Glue it down! I’m adding a baby headband. Someone among all the people having babies is sure to have a girl! Back to the underside, I put the headband over the glued up raw edges. I’m adding a glue hemmed patch over the headband to cover up the raw edges and finish the look. And it’s done! The pink flower is made with 6″ squares and measures about 6.5″ across. The blue flower is made of 2″squares and measures about 2.5″ across. Really enjoyed reading this. If the kids go down early tonight, I may give it a try. :)) Thanks for taking the time to share. I’m so glad you enjoyed it. Let me know how it turns out for you! Thanks for stopping by! I can’t figure out what you mean by fold the wings down and make an airplane. I can make wedding dresses and christening dresses but I can’t figure this out! Thanks for letting me know! First, if you click on the pictures they’ll get a lot bigger and that’ll help a lot. I’m looking at them and it’s a bit confusing with them small, and I’m supposed to know what I’m talking about! If that’s not enough… In the third picture of the tutorial the horizontal edge of the fabric is the fold(along the diagonal from the previous step). The point that is between my pointer and middle fingers is actually two points and it will divide, one to each side, to basically halve the angle of the far right point. The top right edge of each top point will be parallel to the horizontal edge. The fourth picture shows with just one side/wing folded down and the fifth shows both sides down. I was calling it wings and an airplane because the shape you end up with reminded me of making paper airplanes. Let me know if that helps! Writing tutorials is fun, but it’s so hard to take enough pictures of the right steps! Thanks again for your feedback! What size squares did you start with? And what was the finished size of the flower?